The purpose of the #MyFaceAfterGrace skin care challenge is to provide you with everything you need to achieve your most beautiful skin. 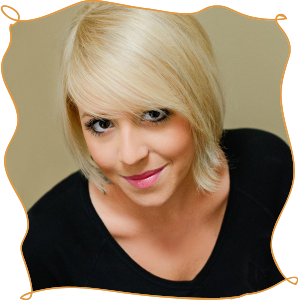 Beautiful skin is a result of healthy skin and we know how to care for skin in a holistic way yielding dramatic results. We will direct you, teach you, and connect with you through this 31 day challenge. Take a photo of your face, makeup free with no filter. This is your #MyFaceBeforeGrace photo. Don’t worry, we won’t ask you to share until you have the #MyFaceAfterGrace photo to make you feel better. Treat yourself to Grace Green Beauty’s facial line that best suits you! Buy here. We want to give you free stuff! Any post or share on social media awards you an entry for that weeks giveaway as well as the end of this challenge MEGA GIVEAWAY. Post photos of Grace products, or yourself using Grace products on YOUR instagram and Facebook for double entry. 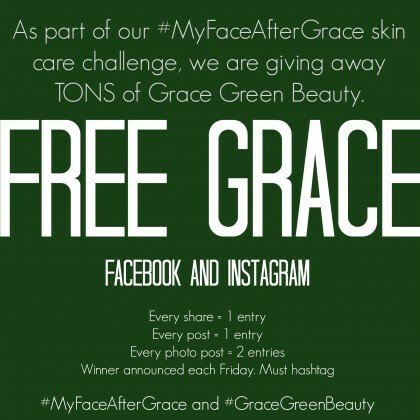 Don’t forget to #MyFaceAfterGrace and #GraceGreenBeauty so that we can track your entries. Stock your cabinet with washcloths. you will need them. Our favorite is here. Commit to the Oil Cleansing Method every single night before going to bed. Activate your own holistic exfoliant based on your personal skin goals. Do this 2-3 times per week. Use TheSerum on your face every day. Be sure to use on décolleté as well. Your skin needs this superfood full of natural vitamin A, C and Omegas. Hydrate from the inside. Drink at least eight glasses of water every day. Take a hot bath. Apply ReAct exfoliant and double as a detoxifying facial mask by allowing to dry. What will you use to activate your holistic mask? Pineapple, Milk, aloe juice, water??? Visit a dermatologist for a mole check. Or at least make an appointment. Use BodyFood or Naked BodyFood from head-to-toe. Clean everything that touches your face. This includes makeup brushes, tweezers. And quit touching your face! We want you engaged… posting, sharing, documenting and connecting! We are all in this together! Find a sunscreen that you actually like and don’t mind wearing every day. This is my favorite! Get more sleep. Put yourself to bed at a decent hour. Mix a DIY mask using fresh fruits or vegetables. I will share mine this month via Facebook! Disinfect your cell phone with an alcohol often! Switch out your pillow case every week. Treat your face with honey and lemon. Slice a lemon in half, add raw honey right on top. Apply in circular movements on a cleansed face. Let set for a few minutes and rinse. Throw out all of your expired skin care products and old makeup. Moderate your diet to assist in beautiful skin. Incorporate leafy greens, fish, unsalted nuts, and fruits into your diet. Focus on a diet rich in antioxidants and lower in dairy, sugar, salt, and wheat. Skip makeup for an entire weekend. Your beautiful! Let your skin breathe. Take a couple of minutes weekly to do the ‘cheek bone squeeze.’ Gently pinch around your cheeks for a couple of minutes to increase blood flow and give a healthy glow. Staying calm and centered is for more than just our mental health. No need to go completely zen, but set time aside for some simple meditation, yoga or deep breathing. These practices keep our skin looking good because we are feeling good! Put probiotics on your face! Every week or two, mix equal parts organic greek yogurt to ReAct Facial Exfoliant. This mixture helps to heal and minimize acne, balance moisture and preserve the good bacteria on your skin. Add cinnamon and flax, and you have a lovely and sweet smelling facial mask. Gently buff this on your skin in circular motions and allow to set for 20 minutes. Either embrace or let go of something in your life. This might not have much to do with skin care, but boy, does it feel good!!! At the end of this challenge, take a #MyFaceAfterGrace photo. We would LOVE to see your comparison. 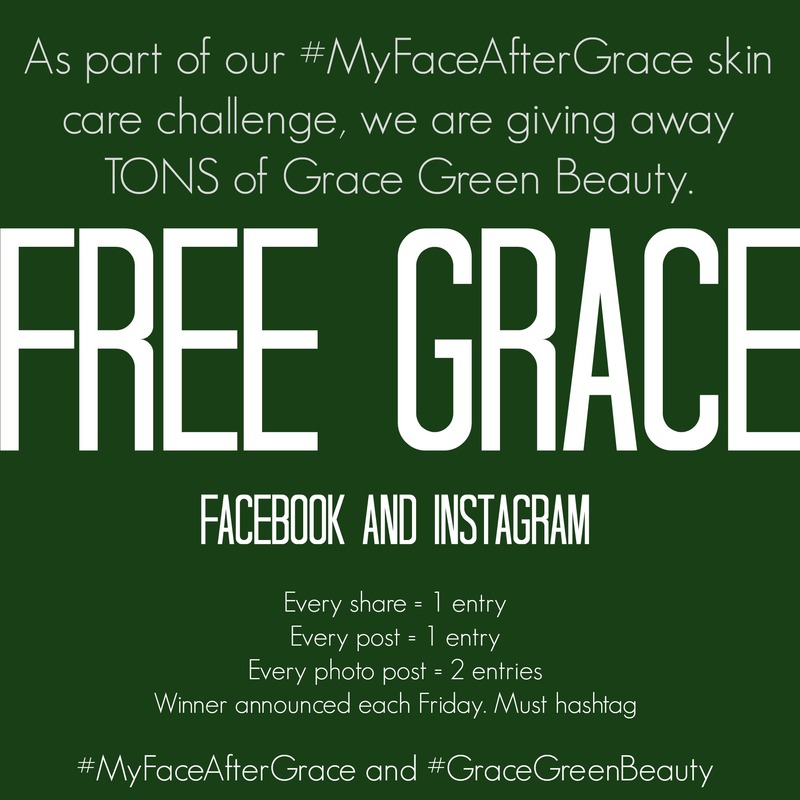 Post your before and after on YOUR instagram and Facebook with #MyFaceBeforeGrace #MyFaceAfterGrace and #GraceGreenBeauty to receive a special gift. I can’t wait to see your transformation. ← #MyFaceAfterGrace Skin Care Challenge.